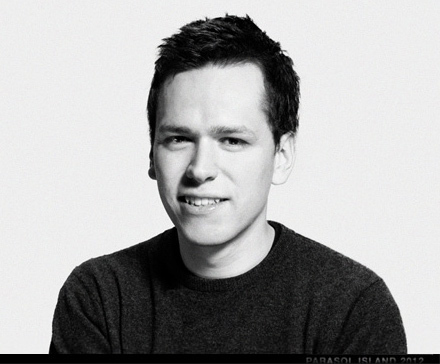 I'm Wilfried Kaiser, a young cosmopolitan designer and animator obsessed by digital and most analog arts. I hold a bachelor of arts in media design (B.A.) from Hochschule für Gestaltung, Schwäbisch Hall and a motion designer and developer diploma from Hyper Island, Stockholm. After gaining first experience working for clients like MTV Scandinavia or Jays from within Hyper Island I worked as a digital artist at Parasol Island, Düsseldorf. Currently I'm with Baermedia creating digital signage for large international clients from a variety of sports, apparel and banking sectors. In addition to my work in TVC, design, motion graphics and vfx I'm interested in interactive user interface design where the user is playfully guided by animation. I'm always looking for a position at a branding company, motion design studio or technology company where I can push myself and the team to apply deep design and animation understanding in a way that solves a given problem in an elegant and beautiful way. My title digital artist allowed me to work on a majority of projects. I switched between tasks in compositing, design or motion graphics every day. In addition to animation I learned immensely in technical areas like node based multipass compositing or 3d tracking. As a full time employee I assigned myself responsibility to help solve issues in every project or role I noticed I could make a contribution to. 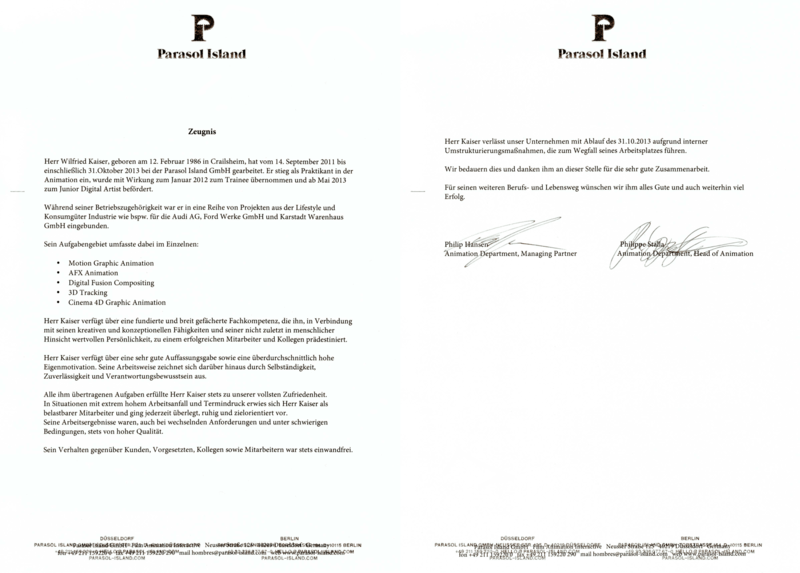 Click here for my Parasol Island employment reference letter in German. At the beginning of every module the HI facilitators form new teams and announce the members. These teams receive a brief with all deadlines, client contacts and deliverables. Then we'd meet and use a set of brainstorming techniques to develop a concept. Once a few ideas the team is happy with and passionate about are found they are presented to the client. In additional meetings they are shown the conceptual artwork like moodboards, styleframes and storyboards once they evolve. The roles like art director, copywriter, vfx supervisor are filled by the team once the winning concept is found. This requires multitalented people who are teamworkers, creatives and generalists and is the reason I studied at HI. It's like the creatives have a switch that turns them into that after the design is finished. This high involvement leads to very creative results that are passionately executed. I held roles as different as a vfx supervisor, art director or team leader for clients such as MTV Scandinavia or JAYS at Hyper Island. I was accepted at KCAI as part of the exchange semester program at Hochschule für Gestaltung. I was interested mainly in KCAIs excellent department of animation and was allowed to study digital animation, figurative drawing, screenwriting, American film history and character development. Across multiple departments. My gut told me that a full time study at GFS wouldn't be the right thing and that it would be better to first focus on obtaining a broad set of design knowledge and understanding. While FHSH put a lot of focus on typography, layout, gui design, screenwriting and project management I worked hard to teach myself some vfx skills and motion design in parallel without compromising my grades too much. I became a partner student in the marketing department at Leitz, Oberkochen. On February 6, 2010 I was awarded "Bachelor of Arts". My bachelor project "Digital Environments for Time Based Media" was graded A.
I spent the first two months learning how to create traditional 2d animations and worked on the 2d animation shortfilm "Camera Obscura". The film was graded A+. This is a selection of my best prior projects where I took either full or major responsibility for design, animation and/or tech. This is a selection of Parasol Island projects where I took either full or major responsibility for design and/or animation. I chose not to include some complex, large projects (mouse over) with limited involvement.